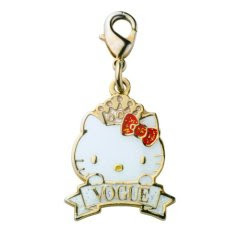 A Rinkya Blog: Hello Kitty, Dior, Vogue June Issue Out Now! The special Vogue issue from Japan is out on stands! Hello Kitty models ALL of John Galliano for Dior’s designs from his new collection. The magazine also comes with a cute Hello Kitty keychain! Order via Rinkya Stores, magazine is only 680 yen! For more Hello Kitty posts, read here!